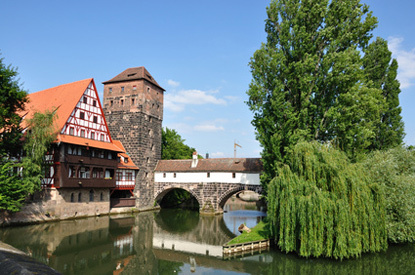 Nuremberg is Bavaria's second largest city. It was the unofficial capital of the Holy Roman Empire, the seat of the Imperial Diet, and residence of numerous Kings of Germany. It is also where the Imperial regalia was kept. In the 1930's Nuremberg became the site of Nazi rallies. In 1935 Hitler convened the Reichstag here to pass the Nuremberg Laws which revoked German citizenship for all Jews. After WWII the city hosted the War Crimes Tribunal. Razed by Allied bombings in 1945, Nuremberg was laboriously rebuilt as it was using the original stones.